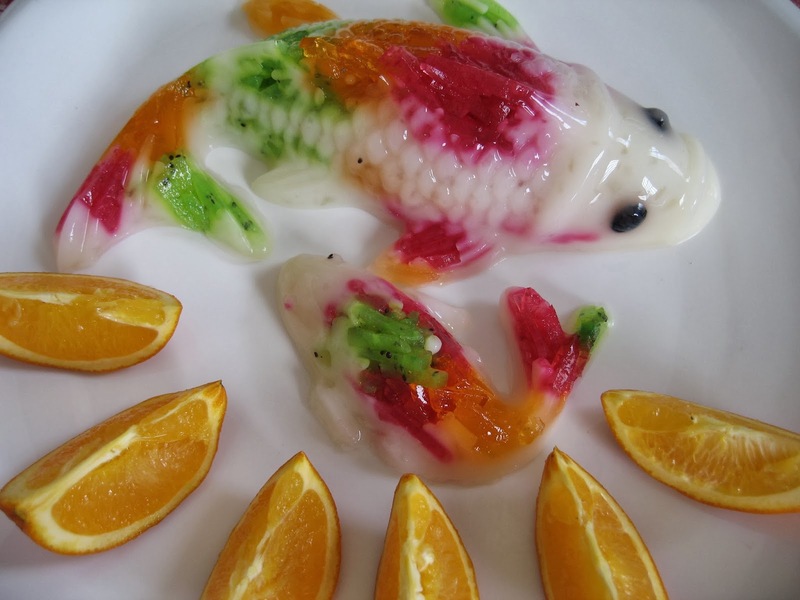 This fruity yoghurt jelly is made into the shape of a beautiful koi fish. 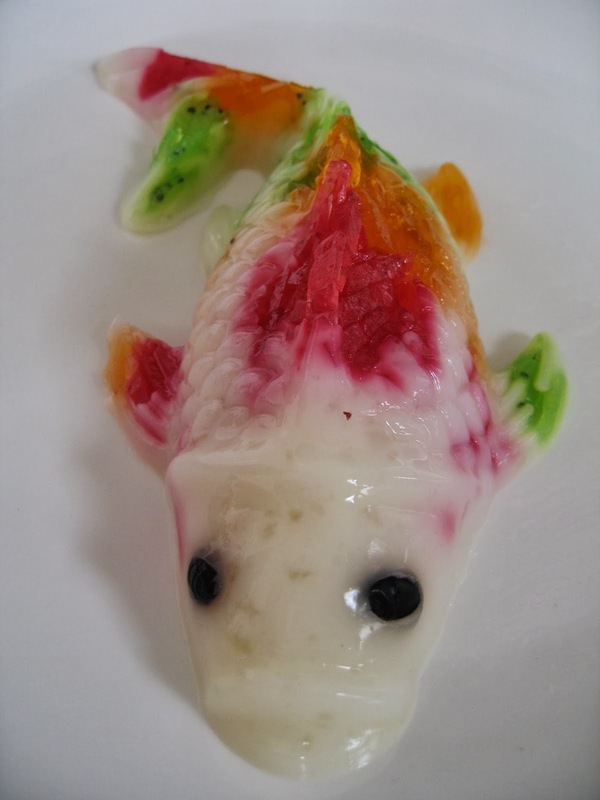 The ingredients consist of three different types of fruits, namely strawberry (red), orange juice (orange) and kiwi fruit (green) to form the beautiful hues of the koi fish. This is a great dessert after a hearty and sumptuous reunion dinner. "Neen Neen Yau Yee", the auspicious sounding name in Chinese signifies so much prosperity and over-abundance of food, wealth and all good tidings, so much so that, there is a spill-over to the coming year! I am sure everyone of us wants an over abundance of good tidings all year round! 1. Heat the first three types of jelly individual to make jelly of red (strawberry, orange (orange juice) and green (kiwi fruit). Pour each colour into individual bowls and allow to set. 2. 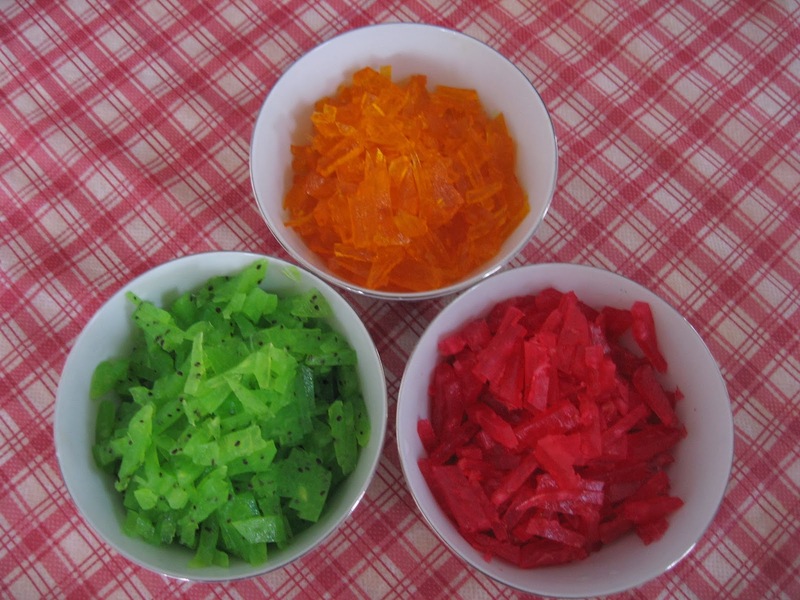 Cut the three different coloured jellies into fine strips. Set aside. 3. Heat ingredients for yoghurt jelly until agar-agar powder and sugar dissolve. Keep warm. 1. 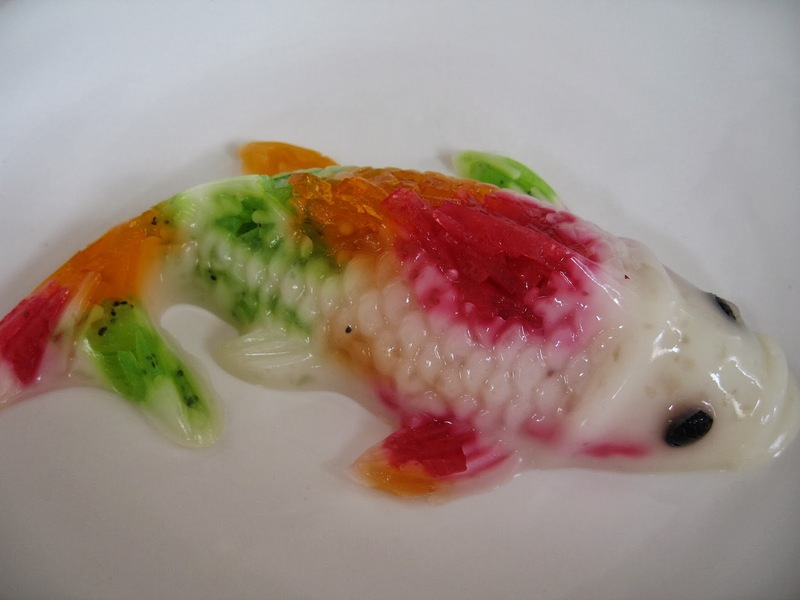 Place small lumps of coloured jelly along the base of the fish mould.Fill half-way first. 2. Place the 2 black beans to make the eyes. 3. Slowly pour yoghurt jelly into the mould into the coloured jellies. 4. Wait a while to allow the jellies to set. 5. Continue to place more coloured jellies to complete the koi fish. Pour in more yoghurt jelly to fill up the fish mould. Allow to cool and set before placing into refrigerator to chill. 6. 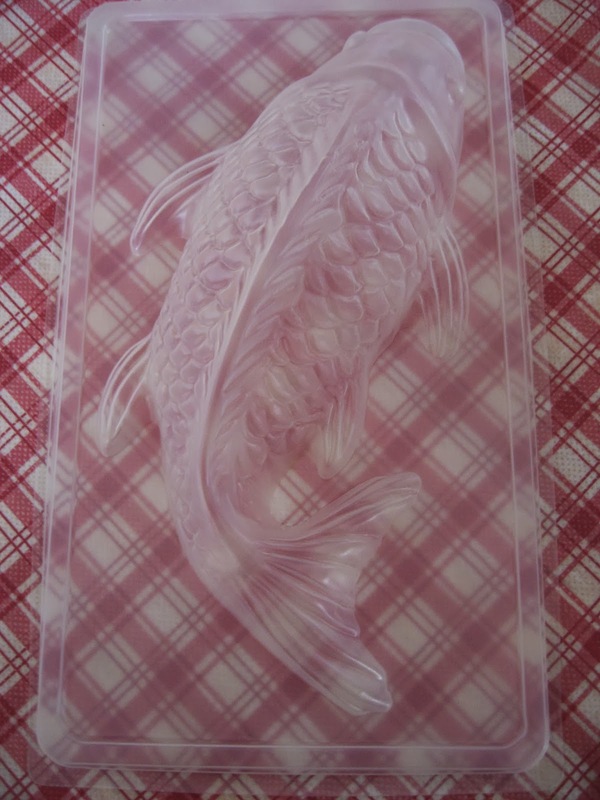 Once fully set and chilled, remove the fish jelly from the mould. Ready for serving. Such beautiful fish, loved the vibrant colours. Perfect dessert for CNY reunion dinner. Actually the eyes of the fish were covered by a layer of jelly making the fish looked like as if it had cataracts but I got them removed and they looked so black and lifelike. Did you know you can create short urls with AdFly and make cash from every visitor to your short urls.